In 1919 Adam Hunter was 50 years old. World War I was over and the devastation it wrought to infrastructure was beginning to be repaired. Engineering firms were busy, and Sir William Arrol & Co, of which Hunter was a director, was no exception. Of the 74 schemes that we know Hunter worked on between 1919-29, more than a third were outside the UK, although some of the fabrication was carried out in Britain. By far the largest share of these were bridges — 17 in the UK and 15 abroad. Unfortunately, little is known of Hunter's home life during this period. However, his engineering skills were much in demand. One of the first projects for the decade was to provide lock gates, a swing bridge, a 5.3m wide bascule bridge and a floating caisson for King George V Dock in London. The swing bridge linked the dock with Royal Albert Dock. It was demolished when the area was redeveloped — London City Airport (1987) now occupies the site. Arrol's bascule bridge was replaced by a wider version in 1990. Hunter reprised Arrol's giant cantilever crane design with a 152 tonne lifting capacity machine for the North British Diesel Engine Co at Scotstoun (Whiteinch) in Glasgow. The crane still exists, though it is not operational. In 1921, the replacement for fellow Scotsman John Rennie's (senior, 1761-1821) cast iron Old Southwark Bridge across the Thames in London was completed. It was constructed by Arrol to designs by architect Sir Ernest George and engineer Basil Mott of Mott, Hay & Anderson. The new Southwark Bridge, the one we know today, features steel plate girder ribs. 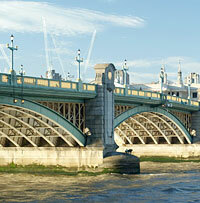 Hunter is also associated with another of Rennie senior's bridges in London. In 1923, three piers of the original Waterloo Bridge (1817) were found to be sinking. Arrol provided a temporary bridge (1924) and the old one closed. It re-opened after repairs but was eventually demolished and replaced by the present structure (official opening 1945). Arrol's temporary bridge was demolished in 1943. Other British bridges of the 1920s that Hunter worked on include six road bridges, three railway bridges, two rolling lift bridges and a swing bridge. For the 1927 Newport Bridge in Monmouth, to keep traffic flowing during construction Arrol re-used the temporary crossing they had built for Southwark Bridge. 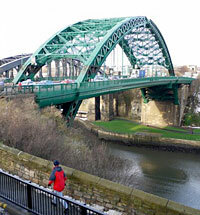 The company's best-known bridge from this period is probably the three-pin steel arch Wearmouth Bridge (1929) in Sunderland, again designed by Mott, Hay & Anderson. In another vein, Arrol, with Hunter in charge, constructed Barton Power Station in Manchester (1920-3) and Stonebyres Hydroelectric Power Station and pipeline, which is part of the Lanark Hydroelectric Scheme (1926-27, engineer: Buchan & Partners). 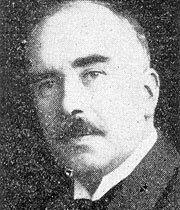 Arrol's site agent for the Lanarkshire scheme was reinforced concrete pioneer Guy Maunsell (1884-1961). Alongside reconstruction work on the South Esk Viaduct at Montrose in Angus, and New Holland Pier in Lincolnshire, Hunter's projects in the UK included three caisson schemes and three dock gate contracts. He also worked on the construction of factories, shipyards and industrial premises, though not as many as Arrol had built in the period 1900-10. From 1917-29 there were ten such projects in the UK, one in Nigeria and one in New Zealand. Around 1920, Arrol began work on an automatic wagon tipper and discharging hopper for Takoradi Harbour (built 1921-8) in western Ghana. There were also sea lock gates for the Johore to Singapore Causeway in 1922, a large pontoon for landing coal at Athens Power Station (c1927), and lock gates for Kidderpore Docks in Calcutta, India (1928), and for Nag Hammadi Barrage, Egypt (1929). Arrol's crane designs were much in demand in the southern hemisphere. The company supplied a moving crane with a lifting capacity of 25 tonnes to South Africa in 1924. A pair of 81 tonne capacity steam-powered floating cranes were constructed for New Zealand, mounted on steam ships built by Fleming & Ferguson Ltd of Paisley, Renfrewshire. The steam ship Hikitia (constructed 1925) went to Wellington Harbour and is still operable, though now powered by diesel. The Rapaki (1926) worked in Lyttelton Harbour until 1988, and is now preserved at the New Zealand Maritime Museum in Auckland. However, most of the overseas projects Hunter worked on were bridges, starting with a railway bridge at Erode in Tamil Nadu, India. He visited Makurdi, Nigeria, in 1921 to assess the site and design the 800m long Benue Rail Bridge (constructed 1928-32). This was followed by the Nabkoi Viaduct near Ainabkoi in Kenya's southern Rift Valley, for the Uganda Railway (so called because it goes to Uganda, though it is entirely within Kenya) around 1922. Between 1924-9, Hunter worked on ten other railway bridges — two in Ghana (Offin River Bridge at Amoako and Prah Bridge), Morhar Bridge at Gaya in India, two for Sudan Railways, two at Buenos Aires in Argentina and two for South African Railways (including Zwartkop River Bridge in Pretoria). Other bridges included the Johore to Singapore Causeway Lift Bridge (causeway built 1919-23) and the Nag Hammadi Barrage Swing Bridge (barrage built 1927-30). In Uganda there was a combined bridge for road and rail traffic, and one in Nepal for road and light railway use. So, the 1920s were filled with work for Hunter — it would prove to be the peak of his career. Although we know little of anything else that was going on for him in these years, the next decade was to start well in relation to his home life, with the marriage of his daughter.